Black Hills is among the small group of companies trusted enough to be a supplier for the U.S. Military. 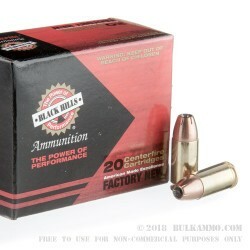 So, when you purchase this ammo you are buying from a trusted company. 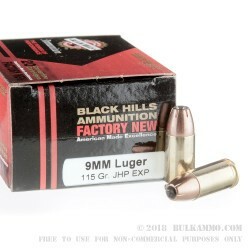 The 9mm 115 grain Hollow Point Extra Power ammo from Black Hills is the perfect choice for a self-defense round. The 115-grain hollow point bullet provides the shooter with the extra power that is needed when confronted with a threat. With a velocity of 1200 feet per second and having the energy of almost 368 ft. lbs. 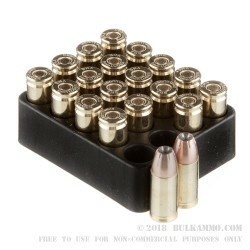 this is an excellent choice for self-defense ammunition. This bullet’s terminal ballistics is a key piece to what makes it a great choice. The wound cavity that is created by this round is an impressive feat for a 9mm. It has penetration up to nine inches and leaves a devastating mark on anything that It comes into contact with. 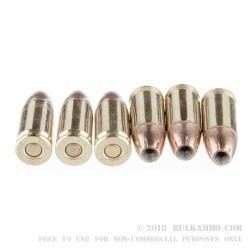 You will not be disappointed if you select this round and use it in your conceal and carry weapon or home defense gun. These bullets are sold in 20-round boxes and will provide the necessary cover that our men and women in uniform have come to rely on.